Mature male has black markings on the inside of his hands and arms. Male sings. Female is larger but mostly mute. Cloaca is prominent on female. Spends the majority of its time on the bottom, but will come to the surface to eat. Should only be kept with large fish, as anything that can fit inside its cavernous mouth will end up there. Unlike the small Dwarf African Frog, the Clawed frog is a voracious predator, and will consume prey as large as small goldfish and crayfish. Frozen Lancefish, raw freshwater fish flesh (Tilapia for example) and earthworms are best foods. Do not feed frozen bloodworms too often, as this food is not rich in protein and may even be bad for it. Like many aquarium inhabitants, it can be trained to take common foods such as pellets, however more uncommon foods (wafers, earthworms, grubs, small 'feeder' fish and invertebrates, et al.) will prove to be better for your frog. Feed only every other day. Otherwise it will just eat and eat. This frog is mainly a night predator and is often inactive during the day. It uses its sense of vibration to find its food. However, it can be trained to take food during the day. It will uproot any plants in the aquarium, so potted plants are best. Likes the company of others of its own kind. Large filter required. This frog, although normally inactive, can be extremely aggressive. Besides devouring fish, it has been known to injure larger fish with its claws. The male likes to sing when it is healthy. It sheds its skin once a month and eats it. It may escape from open top tanks or tanks with weak lids. 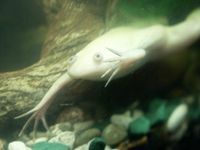 A small African clawed frog can be differentiated from a dwarf African frog by its front limbs. Whereas the dwarf frog has webbed fingers, the clawed frog has fingers without webbing. Be wary when buying this frog in a shop. Often they're sold as baby Dwarf African Frogs! Often sold in the albino form, the African Dwarf Frog does NOT occur in albino form. It appears that this frog is often a carrier for the infectious Chytrid fungus and therefore the aquarium water can carry the fungus. Due to the high level of concern with this fungus destroying amphibians throughout the world, it is probably a responsible thing to add bleach to your waste water before discarding it to prevent this deadly fungus getting into your local water system. Alternatively treat your Clawed frog with Benzalkonium chloride to ensure any possible presence of this fungus is killed. This frog is outlawed in some states (including Kentucky) of the USA due to the adult size they reach and being released into lakes and streams where they eat native wildlife. It is also established in small pockets in the the South of England. Never release into the wild! This page was last edited on 8 August 2011, at 02:07.